This is a card that I did for a swap last March. It was a black and white/vanilla with a splash of color swap. I really like how this card turned out, very elegant. While the stamp set is no longer available you can use any sentiment in it's place. There are many layers of here, I started with a base of Basic Black added a layer of Very Vanilla and another layer of Basic Black. I used a piece of scrap paper to glue my different paper layers together so I could run it through the big shot with the top note die. 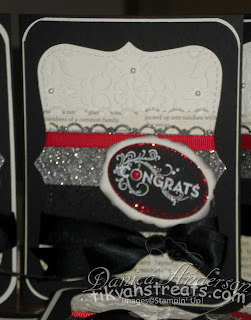 There is starting at the top very vanilla embossed with the vintage wallpaper embossing folder I used First edition DSP and silver glimmer paper that I colored with basic black ink, I used the scallop trim border punch on the top edge of both pieces. 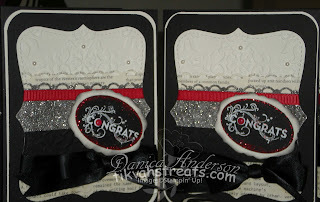 I added a piece of Basic Black embossed with the Houndstooth embossing folder. At the bottom I added another piece of the First Edition DSP. 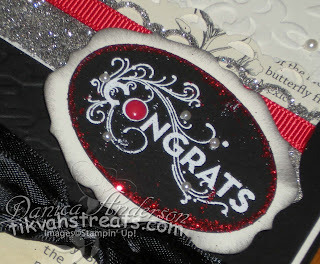 I then ran the layers through the big shot with the top note die added some Basic Black satin ribbon. 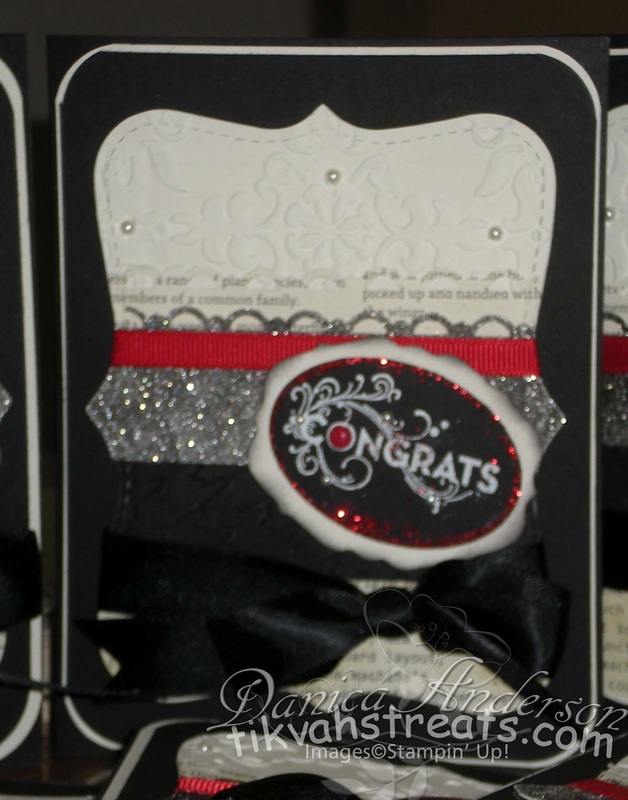 The tag was created with the lots of tags die and the extra large oval punch, I embossed the saying with white embossing powder and glittered around the edge with red glitter and added a red brad to the center of my congrats stamp. Add a few pearls and the card is finished. Wow! I love all of the bling. What a striking card!